This is my little friendly ghost, Whisp. He hovered in the other night and he was so cute, I just had to share him with you all! He is a very easy pattern to pick up, the head and body are all one piece so you only have to attach the arms! (Just how I like it, because I hate extra stitching!) 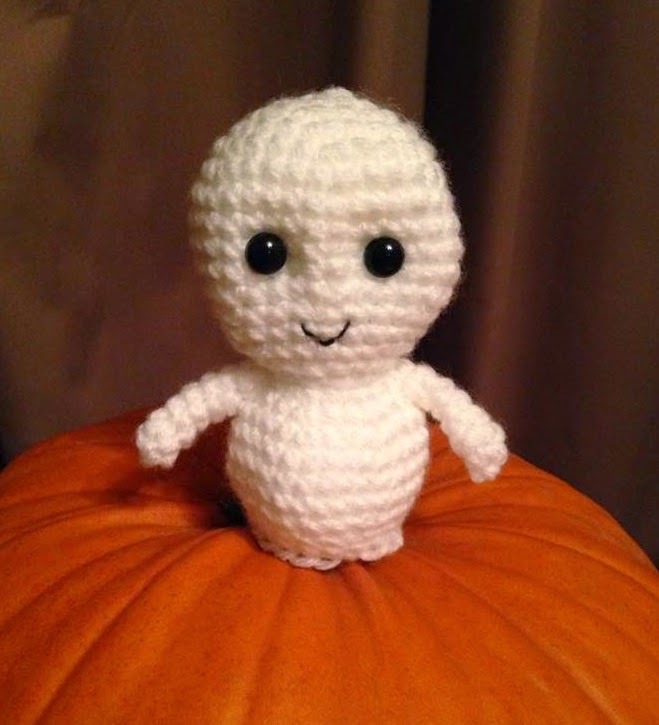 All you need is your crochet hook, some yarn, eyes (I used 9mm safety eyes), and a yarn needle. The gauge or type of yarn you use wont be important for this project, because Whisp is an amigurumi (crocheted/knitted stuffed toy). You just need to make sure you stitches are tight, so the stuffing wont show through, so choose your hook to suit whichever yarn you decide to go with. This pattern is worked in a continuous rounds. I use the US crochet terminology. All the instructions should be continued and repeated around, until you reach your stitch marker. I have used the magic circle to begin Whisp, however if you dont know how to do a magic circle, you can easily find some great tutorials on YouTube! For the Eyes, I have placed the eyes in between rounds 9 and 10, with six stitches between them. To give the eyes a bit more definition, I attached a small amount of the main coloured yarn through the back of the head. Poking it through the very inner edge of one of the eyes, then going back in the head two stitch down. Pull the yarn out the back of the head (same hole as original) and then carry the yarn back inside the ghost across to the other eye, repeating the step and pulling slightly to indent the inside of the eyes. (This process may need repeated once or twice until you are happy with how it looks). Then simply push the yarn needle back through the original hole at the back and tie off. - Invdec around until closed, FO. If you do get one made, please feel free to share your lovely creations with me on my facebook page, Bugsy's Burrow. I would love to see them!